Sign-Ups will open on Saturday, 16 September at 1800PRT! In the past week, the teams have been working on preparing the team structure and are now eagerly waiting to welcome their new comrades-in-arms! Start as a regular soldier, but if you prove your leadership and fighting skills on the battlefield, work on your team's propaganda or recruit and train members for your team you can move up the ranks easily. Support your team by participating in team and squad trainings or help planning the strategy for the next battle. Many of the officers of both teams as well as the PRT staff joined the past campaigns as soldiers and moved through the ranks. Do not hesitate to join up - even if it's only a reserve slot - everyone gets their fair chance to play and be promoted to normal soldier! Training and playing sessions are organized by teams and squads. Dynamic and interactive campaign world map that pairs up a multitude of PR maps and layouts in several "Operations" requires strategy and planning between battles to win the campaign. Interactive battleplanning tool with map and asset information. Extensive forums for preparation, communication and organization for both teams. 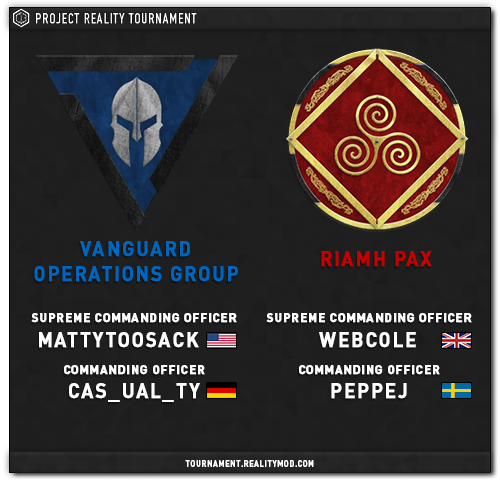 The administration is looking forward to welcoming you all to the Official Project Reality Tournament! We are here to answer all the questions you might have and are working hard to make sure you get what matters - the best Project Reality gameplay possible. We are using an updated, automated system for the tournament sign-ups. All you have to do is fill out a form and hit submit! Fill out all fields as best you can, so that the commanders and admin team are able to get a good insight into you and your capabilities. You can check back regularly to see the status of your application. Soldier Sign-Ups close as soon as the teams are filled! There are 90 slots in each team to be filled (70 members, 20 active reserves per team). Please note that after a team hits the 70 member limit, further applicants to that team will automatically be allocated to the reserves. The PRT Rules and Regulations explain what it means to be a reserve. The total number of slots available is 190 for both teams combined. You need a working microphone and basic understanding of English to be able to participate in the tournament. Once submitted, you cannot edit your application! Be sure your application is correct and complete! You can sign up with friends! Name 2 people you want to play with. Those two people also have to nominate you and each other. Keep in mind that changing this later is not possible! Make sure everyone gives the correct information so that you can play together. If you choose a team, you have the possibility to request a role you would like to take. You can specify what you like doing in PR in a free text field as well. Make sure you read the Tournament FAQ as well as the Tournament Rules prior to signing up! It is especially important that you understand the activity requirements and have the time to participate in the tournament! If you have any questions that you would like to ask before applying, you can post a Support Ticket. Not sure if you should sign up? Check out the links at the bottom and join us in IRC or the PRT Forums to have a chat! If you have no account in the PR Tournament forums yet, Register here to be able to sign up as a soldier. Officers/NCOs that were not selected (yet) and contacted will automatically get their signup moved to soldiers. Sign up on Saturday, 16 September at 1800PRT! If you have signed up already, check the status of your application with the same link. Signups are open now but there's limited spots. 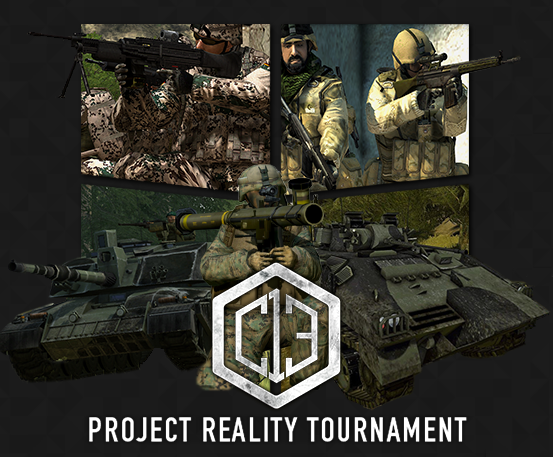 Check out the Project Reality Tournament! Signups are still open if anyone is interested. if the banner says 'signup now' then it's actually open. Just click on it. During certain periods in the campaign the signups open again. Last edited by kkn0t; 2017-11-18 at 13:53.. This usually happens when you have not confirmed the email address you used in your signup. Look through your spam folders for the confirmation mail or go to your user cp->change password/email and update the email address there.